It is quite common for someone going through a divorce to encounter financial strain and difficulties. There may be missed bills as you and your spouse are divesting from your joint accounts, you may have to spend a significant sum on renting a place and moving out, or there may be financial decisions made with the intent to harm you (if you and your spouse are going through a contentious divorce). These financial difficulties may wind up harming your credit score, which is something you need to try and avoid. Why? Because your credit score affects everything from your ability to obtain a credit card, purchase a vehicle, or purchase a home. A damaged credit score may mean years of paying higher interest rates on numerous items. This can, and should, be avoided. Here are some tips to help protect your credit score during the divorce process. As soon as you can, run a credit report to see where your score is currently. This gives you an anchor to ensure your score has not been adversely affected. If you notice your score suddenly drops, you can quickly investigate the cause and remedy the issue. Running a credit report also makes sense because each item on your credit report should be addressed in your divorce decree. Do not leave anything out of the decree because that creates ambiguity about who is responsible for servicing the account or loan. Once the divorce is finalized, make sure to close all jointly-owned bank accounts and credit cards. This is necessary to avoid your now-ex-spouse from running up charges on these accounts and affecting your credit. Divorce can be an emotionally-charged experience. Some spouses act irrationally and cut off the other spouse out of spite. This could result in you being unable to access funds to cover your monthly expenses. To avoid this issue, open a bank account where only you are the user. This way, you have access to credit and funds independent from any joint accounts. On a related note, your spouse’s mistakes can actually harm your credit. For example, if your spouse makes a late payment on an account where you are an authorized user, it will have a negative impact your credit score. This is why you need to remove your name from any accounts where you are an authorized user. Your divorce decree should clearly stipulate that you are responsible for the servicing of debt taken out in your name rather than assigning your debt to your spouse. Why? Because the original loan is an agreement between you and the creditor. Simply assigning your debt to a third party will not absolve you of your commitment to service the loan. The experienced Houston divorce and family law lawyers at Lindamood & Robinson, P.C. are here to help you through this stressful and difficult time. 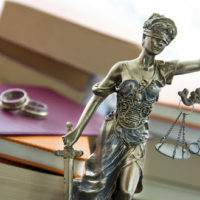 Our experienced lawyers handle all types of divorce cases including contested divorces involving significant estates, complex child custody issues, and even simple uncontested marriage dissolutions. Whatever family law matter you have, we can help. Contact our office to schedule a meeting.